Othello, as per dug out information remembered from school days would look like this: Sneaky Iago drives an easily led black general, Othello, into raging jealousy ending in the murder of his angelic and innocent wife Desdemona. “The green-eyed monster which doth mock the meat it feeds on.” Cleverly described, but probably a little racist in the choice of participants. In this version directed by Iqbal Khan, the picture is significantly more complex. 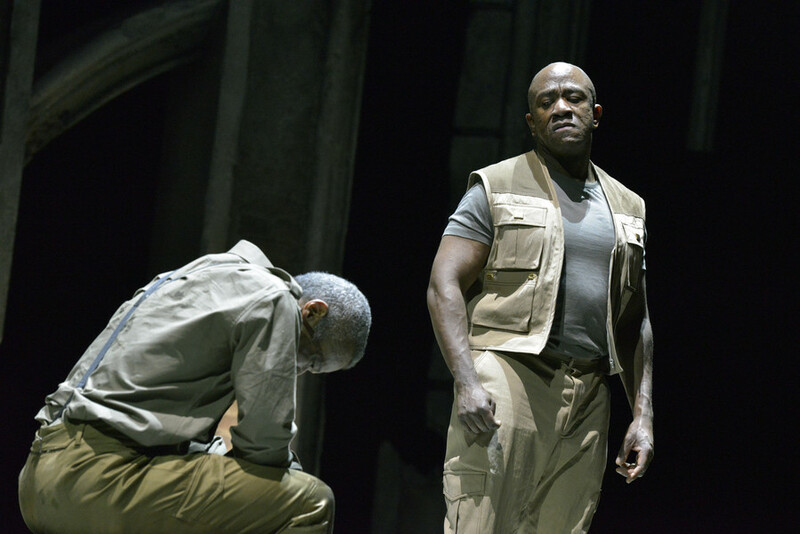 Iago (Lucian Msamati) is by no means fairer skinned than Othello, and already in the first scene, in a gondola together with Roderigo (James Corrigan), the racist reference to Othello as “thick lips” vexes him personally. His main incitement, however, is the blow to his pride caused by Cassio’s promotion in which he was passed over. 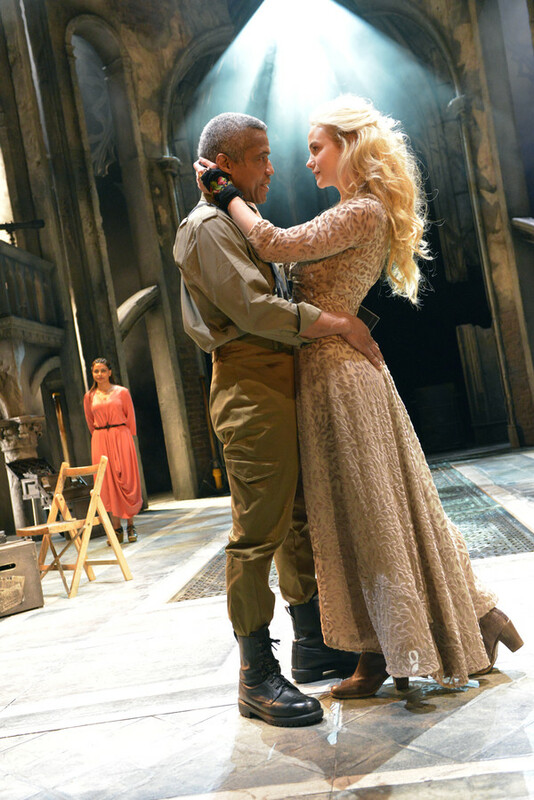 Whilst Desdemona’s father (Brian Protheroe) is protesting to the Duke (Nadia Albina) against the kidnapping of his daughter (Joanna Vanderham), Othello is entrusted with the task of rescuing the state. Hugh Quarshie, appearing here as an authority figure as well as a sensual and attractive specimen of eye candy in the prime of his life, leaves no doubt as to what attracted Desdemona to him. According to Shakespeare’s words, it was pity, hmmm. After a successful battle, the victory celebrations take place in Cyprus. Joanna Vanderham’s Desdemona, with her dance, does not fail to impress Cassio (Jacob Fortune-Lloyd), the cause of Iago’s wounded pride. Here already, Othello gives us a clue that jealousy is not entirely beyond him. The atmosphere reaches its climax when, after a folksong from Zimbabwe – sung by Iago-Lucian Msamati, Cassio and Montano (David Ajoa) engage in a rap battle. Controlled by Iago, the situation becomes messy and turns into a fight. Suddenly, all the lightness is lost. The next scene painfully reminds the audience of the fact that the world of the military is not throughout unblemished and heroic: From the “almost venial” fight through to the torture of a prisoner, a backdrop of the ever-present open or subliminal violence is drawn. From now on, Iago is working relentlessly on the kindling of Othello’s jealousy. When Iago’s wife Emilia (Ayesha Dharker) delivers the requested handkerchief that Desdemona dropped, the fuse is set alight. The web of deceit, wounded honour and self-righteous violence becomes a death-trap for Desdemona, and not just her. Electrifying, funny, tragic and absolutely convincing, Lucian Msamati dominates the stage as Iago. 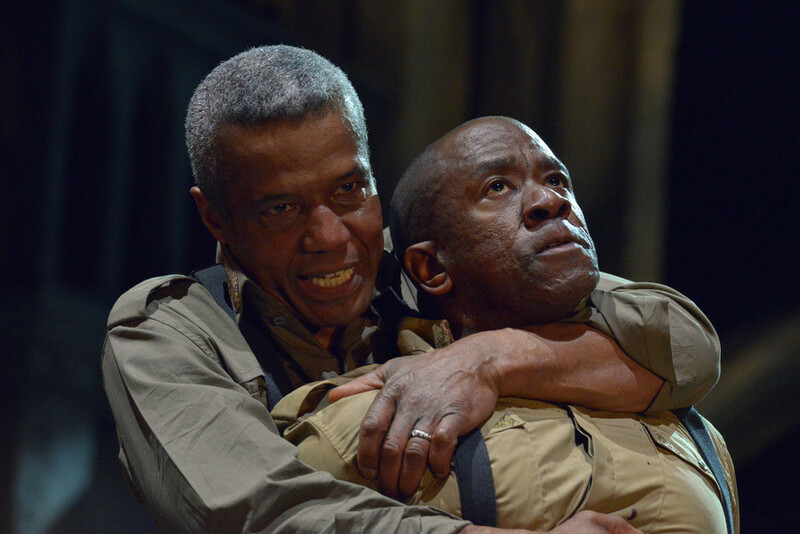 Hugh Quarshie’s representation of Othello in his transformation from being amiable, charming and a little boyish to becoming an obsessed “honour” killer is an achievement of nail-biting authenticity. Joanna Vanderham dances and sparkles her enchanting Desdemona until she becomes anxious and quiet. Ayesha Dharker fills the part of Emilia with heart and wit, and in her big scene towards the end, she sets off a firework display of emotions. A massive kudos to the fantastic music under the direction of Akintayo Akinbode. This entry was posted in Theatre and tagged Akintayo Akinbode, Andrew Franks, Ayesha Dharker, Brian Protheroe, Ciaran Bagnall, David Ajao, Diane Alison-Mitchell, Eva Feiler, Fotini Dimou, Guy Hughes, Hugh Quarshie, Iqbal Khan, Jacob Fortune-Lloyd, James Corrigan, Jay Saighal, Joanna Vanderham, Ken Nwosu, Kev McCurdy, Lucian Msamati, Nadia Albina, Owen Findlay, Rina Mahoney, Royal Shakespeare Theatre, RSC, Scarlett Brookes, Stratford-upon-Avon, Tim Samuels on August 23, 2015 by lingonews.